During the last Congressional election, a strident Tea Partier argued (unsuccessfully) that I should vote for that pro-choice, pro-gay marriage, pro "exaggerate my meager military record to get the veteran vote" Mark "the jerk" Kirk, despite his moral deficiencies, yelling over the Internet that "this election is about economic issues, not moral ones." I countered by saying that the two can never be separated, and if the Tea Party really believed in this dichotomy, then its influence would be short-lived. Fortunately, shortly after our caustic conversation, a true conservative Republican leader released a book detailing, with perhaps the most compelling words I've read to date, on why these issues together must be weaved in order for our country to succeed. The leader's name is Bobby Jindal, and the book is entitled Leadership and Crisis. The volume opens with a chapter on the BP-Gulf Oil Crisis, with a scene of President Obama finally arriving on the Louisiana shoreline nearly two weeks after the deepwater well had blown. Eager to bring his concerns (and proposed solutions) to the president face-to-face, Jindal instead finds the president more interested in the right photo-op than in finding the right way to keep the oil from spreading. The president, according to Jindal, said "not a word about the oil spill," but, leaning forward with his best side to the camera, whispered to Bobby, "Careful...this is going to get bad for everyone" (pg. 2). Obama "trusted the bureaucrats...[h]e hadn't been in government long enough (or the private sector, for that matter) to know you have to be skeptical" (pg. 8), and thus believed all the BS BP was feeding him. "I don't need to see you guys on CNN criticizing us every night!" warned Obama to Jindal and the parish leaders, who risked censure and even jail as they commandeered Coast Guard boats and set up booms and skimmers on their own without Federal approval. Still, to Jindal, the risk was worth it. "For the people of Louisiana, this was war. When we saw oil coming on to our coast, we did everything we could to stop it...[t]here was no time to call back to headquarters, to fill out some forms...or to wait for...Washington" (pg. 10). To understand how a book so packed with practical ideas (Jindal tackles everything from health care to education to immigration and presents logical, step-by-step solutions to previously unsolvable problems) could be written by a man still under the age of forty, one must first examine how he came to embrace the ideals that made such leadership possible. Jindal's parents immigrated from India with Piyush (his given name) as "a pre-existing condition"; his mom was already pregnant with the future governor when she arrived in Baton Rouge with a grad school grant to study physics at LSU. I guess you could say that because of his rather unique migration situation, the junior Jindal always considered himself an American, so much so that by the age of four, Piyush announced to his astonished parents and pre-school class that henceforth (in honor of his favorite Brady Bunch character) he would be known as "Bobby." Still, this change of name was nothing compared to Jindal's faith journey. Raised by devout Hindu parents, as a pre-teen Jindal began to question things when his best friend Kent told Bobby he would miss him when he was in heaven and Jindal was in hell. By his sophomore year in high school, Jindal needed answers, so he dusted off the Bible that Kent gave him and read the Good Book from beginning to end. As remarkable as that feat was for a sixteen-year-old, the fact that he read the entire Old and New Testament in his closet with a flashlight (so as not to arouse his folks' ire that he might be changing faiths) makes it all the more amazing. "I was probably the only teenager in Baton Rouge who told his parents he was going to a party so he could sneak off to church" (pg. 48-49), joked Jindal, but when Bobby asked God to give him a sign that Jesus was indeed "The Way," and the Lord instead gave him two (a viewing of a stark black and white film on the redemptive power of Christ's death and resurrection and a date with a beautiful pro-life Catholic co-ed), Jindal became convinced that a conversion to Catholic Christianity was not only the way to salvation, but a guidepath for all the policies he would decide on earth as well. "Once you take God out of the equation, you run the great risk of seeking to solve problems by applying [the] 'thinning the herd' argument to humankind. It's not that anyone really wants to do it, it's just that it needs to be done to preserve the quality of life for the rest of us. Of course, it's all cloaked under the guise of compassion. [At least] the Chinese [whose one-child policy Obamacare is increasingly leaning toward] are more honest. They are trying to keep the herd under control by any means necessary" (pg. 220). As much as I enjoyed the "Of Life and Logic" chapter (for it proved Jindal's pro-life stance is not mere rhetoric, but a way of life), his "It's the Culture, Stupid" chapter is perhaps even more important, especially to Tea Party Republicans like my friend. After proclaiming "I am an economic conservative if ever there was one, not just in theory, but in practice," then detailing how he has drastically cut taxes and eliminated over 6,000 government jobs (while at the same time moving Louisiana from 44th to first in legislative disclosure laws) during his term as governor, Jindal concludes by adding, "but I'll be honest with you: I wouldn't give a plug nickel for capitalism...in a country where people don't play by the rules...[and] don't share a common view of the dignity of all mankind as God's creation..." (pg. 263). The "who dat" governor who wears an Adam Smith tie is quick to point out to Republicans who quote Smith's classic The Wealth of Nations, which praised the morality of the market economy and the power of the profit motive (in other words, selfishness was good because it motivates people), that Smith's lesser known The Theory of Moral Sentiments warns in no uncertain terms that "the free market system would not work well--and could even bring out the worst in some people--in a society that lacked a strong moral foundation" (pg. 264). Jindal then shows how the subprime loan scandal was a perfect example of free market profit without Godly morals. Perhaps Democrats (and some Republicans) were stupid enough to think that risky loans to low income minorities was a good idea, but men like Angelo Mozilo, the CEO of Countrywide (who publically praised the no-money-down loan idea but in private called it "the most toxic, dangerous product in existence") knew exactly what they were doing. Their godless greed not only nearly destroyed the nation's economy, but in Jindal's mind proved St. Paul's economic "theory," that "The love of money is the root of all evil" (1 Tim 6:10), painfully correct. But if America's recent moral/economic collapse showed Christ's eternal words "You cannot serve God and mammon" (Matt 6:24), to once again be true, Jindal's Christian message in Leadership and Crisis confirmed to me that he should be our next nominee for president. Sadly, in these last days of 2010, this humble-yet-gifted leader as yet has no plans to pursue the presidency. I sometimes wonder if this usually fearless soul still feels, after being "savaged by the press" for "my performance" in the February 2009 Republican response to Obama's first speech to Congress, that "a guy who is 'teleprompter challenged,' versus the king of the teleprompter" is a "[b]ad match up" (pg. 37), and thus fears to heed the call. On the other hand, when this unwavering apologist for America's greatness ends his book with a quote from Hoosiers, "Son, God wants you in the game," then calls us all to "get in the game...your country needs you" (pg. 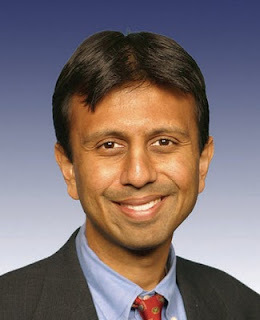 283), and lastly leaves us his web address (bobbyjindal.com) so we can send him our opinions, there is still hope. For would not the man who once accepted an old movie and a devout date as a sign that he should convert, now accept a million "Son, God wants you in the presidential game!" e-mails as a sign that he should run? For even more reasons why Jindal should be our next president (and your own copy of Leadership and Crisis), please click here.